Your sweet tooth has gotten you into trouble. Just think of the clean eating streaks that you’ve abandoned for a slice of cake, and all of the extra calories you’ve eaten just to have a taste of something sweet before bed. Where’s that sweet tooth gotten you? Into pants that are another size larger. Into your doctor’s office for another lecture. Into a body that you no longer enjoy. Yes, sweet are delicious and tempting, but the life-long repercussions far outweigh the momentary pleasure. To help you conquer your sugar craving once and for all, I’ve identified 5 sweets you should ditch, and a healthy substitute for each. Nothing gets refined sugar circulating through your body quicker than a fistful of candy—and if you’re in the habit of eating candy daily then your body will crave it. Candy has virtually no nutritional value, other than caloric energy, and will quickly end up stored on your body in the form of unwanted, annoying fat. Do This: Swap candy out for a handful of unsalted nuts, a few pieces of unsweetened, dried fruit, or a small square of very dark chocolate (at least 72% cocoa content). Cake, cookies, brownies, pastries, donuts, and pies are filled with sugar. While these may not taste as sweet as candy, the combination of refined sugar and white flour will spike your blood sugar just the same. Very much like candy, regularly eating baked goods may become a habit. Break yourself of this and you’ll find the number on your scale going down rather than up. Do This: Put down the cookie and reach for a piece of fresh, seasonal fruit. Fruit is nature’s candy and is every bit as blissful as a slice of cake. Serving a beautiful fruit platter to guests can be as delightful as any baked treat. Nothing makes you feel as happy and carefree as a bowl of creamy ice cream…until that ice cream makes its permanent home on your waist. Very much like candy, ice cream has few nutritional benefits. Do This: Mix unsweetened, nonfat Greek yogurt with a scoop of vanilla protein powder and mix in some chopped, fresh fruit. This creamy delight is much lower in sugar than ice cream and tastes amazing! A regular can of soda pop contains the equivalent of 10 packets of sugar. That’s more sugar than you should consume in a full week! Soft drinks something that you get into the habit of drinking and then do without thinking. The good news is that a habit can be broken and then replaced with something healthier. Do This: Take soda pop out of your diet. Period. There are plenty of other, healthier, beverages available to you. Try the recipes for Spa Water below. Smoothies, blended coffee drinks and milkshakes are all tempting treats, especially in hot summer months. Don’t give in to the temptation! These items are even more deadly than most treats since they are consumed through a straw and don’t make you feel full. Let me assure you that even though you don’t feel full, like you would after a piece of cake, you’re still taking in a bunch of sugary calories. Do This: Make your own healthy blended drinks at home by using natural sweeteners like stevia, or simply by using fruit. Blend a delicious protein shake with ice, milk and protein powder. A great thing to remember is that once you’ve fallen out of the habit of eating sugar, your body will no longer crave it. This means that each day spent in discipline will bring you closer to the day that sugar no longer has a hold over you. Imagine how much happier and healthier you will be! Eating healthy is half of the battle when it comes to fitness and wellness. The other, equally important, side is maintaining a regular, challenging exercise program. For an exercise program to be challenging it must always be changing. That’s why my workouts are never the same. It’s my goal to get you into the best shape of your life. Call or email today to begin your transformation! 1. Combine the herb marinade ingredients in a small bowl. Place 1 Tablespoon of the marinade in a large Ziploc bag with the asparagus pieces, and the rest in another large Ziploc bag with the chicken breasts. Make sure the chicken and asparagus are fully coated with the marinade, and then place in the refrigerator for an hour. 2. Heat a grill pan and another medium pan. Place the chicken breasts on the grill pan, and cook 4 minutes each side, until there is no longer any pink in the middle. Sauté the asparagus in the medium pan, stirring often while the chicken cooks. Remove both pans from heat. 3. Once the chicken has cooled, slice each breast into even strips. 4. 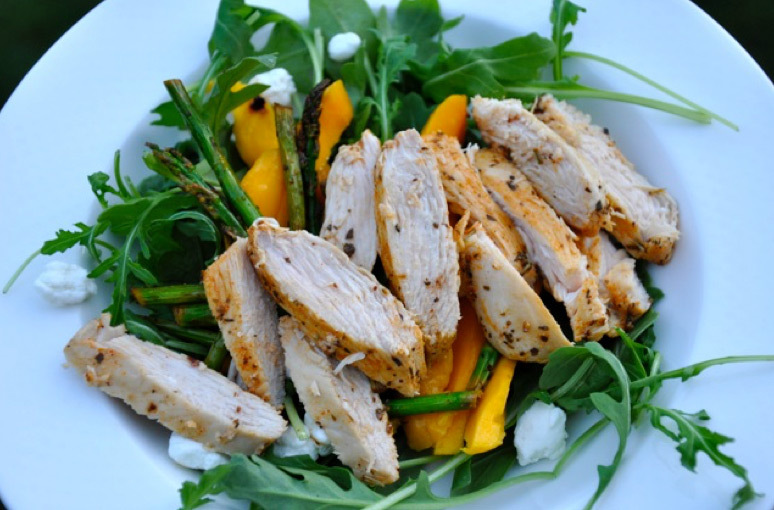 In a large bowl combine the arugula, mango slices and crumbled goat cheese. Add the cooked asparagus and the chicken. Mix and serve. 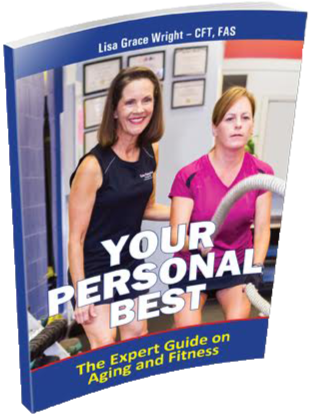 Your Personal Best The Expert Guide on Aging and Fitness is now available on Amazon!